"3-2-1 Action" - Part Two: "The Signal"
Kryptonite Man escapes with the aid of the monkey from the Zoo. Jimmy, meanwhile, is conflicted about his powers, and seeks to find out their nature while adopting his hero identity, Mr. Action. Kryptonite Man takes tech and begins to auction off his future experiments. Jimmy happens upon him. They fight, Jimmy loses, and Kryptonite Man ties him up. Superman arrives after following a trail, and does battle with the Kryptonite Man using an anti-kryptonite radiation spray. He wins, but Kryptonite Man melts the spray and attacks, taking Superman down. Jimmy, recovering, uses his now-repaired signal watch to call for help. Krypto arrives. Story - 1: People say, "Neal, you should give zeros." Never have really wanted to. But this was a bad issue. A very, very bad issue. I don't know if it's worse than what has traditionally been the worst Superman story I've ever read, the first issue Joe Casey ever did, which was so convoluted with plot holes I was able to write eleven pages of material on the inconsistencies. But at least THAT story, while rife with inconsistency, did not use thought bubbles, a convention that's been dead for longer than a decade with good reason, monologuing extrapolation, something that died in the seventies for any writer of note in comics, and didn't destroy an otherwise compelling character. The monkey! The lab monkey we tested the apparatus on! It must have been drawn to me - sensed the similarity in the kryptonite radiation within us both! If only I could lure him closer - I could tap the power inside him, add it to my own and overcome this damping device! But how...? Well, that'll do. I'll have to study you, monkey... learn why the kryptonite barrage gave the two of us such different abilities. But for now, time is short. Come here. Read that. I mean, just read it. I understand that sometimes people talk to themselves as a convention. Generally, the idea is to AVOID it sounding like this. Page 3-6: Jimmy Olsen extrapolates (telling instead of showing) through thought bubbles, a convention largely forsaken in the comic industry for its archaic qualities and because it's lazy writing. There's literally a few pages of abject telling characterization, establishing what we essentially already know, that Jimmy has new powers he can't control, and is having trouble coping with it. Yeah, we caught that. GO somewhere with it. Page 7: Clark takes an entire page to disappear to be Superman (point being, Jimmy notices but doesn't catch that he's doing the same thing, but still, taking a whole page for what used to be accomplished in one panel needs more justification). Page 8: A series of captions tell as opposed to showing what The Avenue of Tomorrow is to the people who are part of it. This is something that was already established as far back as the first issue of the New Earth run, and is thusly redundant and filler. ...while I avail myself of your equipment." For those of you who aren't writers out there, there's a very easy way to do this without extrapolating like this. It involves structuring the plot a little more, which isn't hard. I know Busiek knows how to do this, because I've seen him do it well. My guess is that he's consciously trying to go for this "Silver Age" feel. Except what this story is missing, as this page clearly illustrates, is that we as readers have no problem with Silver Age concepts...we love them. What we hate is crappy writing, and this page is a key example of crappy writing, no matter what has come before or after. Page 9: Kryptonite Man continues monologuing about the thing he's working on, telling, not showing. Jimmy has a few more thought bubbles. Also notably, the narrative flow is broken by placing an action that belongs on page 10 to the right of page 9, which has no relevant plot points to said panel. That's a more complex mistake, but still a big one. Page 10: Jimmy randomly happens upon Kryptonite Man. Deus Ex Machina. Kryptonite Man, meanwhile, begins to try to extort money for his experiments (which he hasn't even CREATED yet) from four villains, Dr. Cyber, Calculator, Tobias Whale Esq., and Atomic Skull. Somewhere between the old Earth and New Earth, Calculator stopped brokering in information and started into technology, and somehow the Atomic Skull went from a tragic theater figure who is confused and violent into a computer-saavy pseudo arms dealer. But hey, why would we want an A to B for that? Page 11: Actual dialogue, for the second time this issue (the first happened when Clark broke away to become Supes, and apparently regardless couldn't find Kryptonite Man before Jimmy did). Unfortunately, it's an archetypical scene from an early James Bond movie, where an uncomplex figure tries to barter for large amounts of cash, sure that it'll work somehow! Jimmy busts in with his powers that he can and can't control, knowledge and lack of knowledge of other superheroes and their identities, and his continuity that isn't continuity of things that have and haven't happened to him in the past. Page 12-13: The issue actually begins. Jimmy and Kryptonite Man fight. Unfortunately, it's punctuated by cheesy dialogue, insane, random powers, and the "Superman vs. guys with guns" problem. Unequally matched opponents equals traditionally lame battles, though I do admire the idea of Jimmy as comedy relief. If this were funny and/or interesting. The only thing going for these pages are when a monkey gets sicced on Jimmy, but that only works because I'm previously biased to love monkeys, so is that skill, or is it like showing a hetero guy the female body? Oh yeah, and more thought bubbles from Jimbo telling as opposed to showing. Sigh. Page 14: Jimmy is defeated. Intead of killing him or tying him up without explanation, the two rational courses of character action, Kryptonite Man goes to great lengths to point out exactly why he's leaving Jimmy alive to... the audience? Because I can't think who else to, save the monkey. Yeah, maybe he's talking to the monkey. It's still bad writing. Extrapolation through monologue. To give you an idea, I'm reading the Superman Silver Age showcase collections right now, and they do the same crap, through the whole thing. They're essentially the same kind of story, with one exception. The actions and dilemmas of this villain aren't that compelling at all. Both have bad writing. This lacks a compelling premise. Kryptonite Man is extorting stuff and Jimmy has powers. And? Page 15: Jimmy MONOLOGUES to himself for five panels about how he's going to escape. I kid you not. Look at this book. Read it. I GET that people talk to themselves sometimes. But this is bad writing. Page 15: Superman spends a page figuring out that a guy's been hit with Kryptonite radiation at the hospital, then following the trail to the Avenue of Tomorrow. Which, though it's where Superman encountered him first, I guess he hasn't checked, and somehow he can't follow the Kryptonite Man's path through the visual spectrum. I don't buy it. It's a convenient way to give Jimmy time alone with the villain, which I'd forgive if it was compelling. It wasn't. 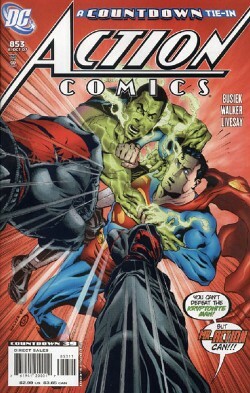 Page 17-19: Superman and Kryptonite Man duke it out. They can do this because Superman has a special invisible Kryptonite repellant spray. No, really. You guys ever seen the 60s Batman movie? STAR Labs handed Superman the Shark-repellant bat-spray. For those of you not in the know, suffice it to say an arbitrary plot device to get Superman to punch back and forth with Kryptonite Man was conjured from thin air rather obviously. Students of English take note, this is why arbitrary slug-fests are maligned. The idea is that the dilemma and its resolution FOLLOW from a path of logic, even if in the realm of the fanciful. Superman is vulnerable to Kryptonite, and bringing in a "special spray" that we'll never see again for a slugfest falls in the category of trite. Page 20: Unfortunately, this spray has a weakness. Heat. Uh, yeah. No, really, that's what the story indicates. Exit Superman, to the floor. Page 21: Kryptonite Man spouts inane banter at Superman's body instead of running off, leaving Jimmy time to repair his signal watch. Silly villains, always monologuing! Oh yeah, more Jimmy thought bubbles, too. Joy. Page 22: Krypto appears from nowhere. Deus ex machina! So, in conclusion, we have a story that tells, doesn't show, save for about four to five pages, in which an arbitrary fight occurs. We have several instances of improbable deus ex machina that don't fly. We have "shark-repellent bat-spray." We have a compelling villain turned into a money-hungry, monologuing idiot. We have Superman dumber than a cub reporter, out of character and for the sake of a bad story. We have a radiated monkey. Okay, Busiek, you got me with that. I'm listening. Titano I'll bite on. I admire Kurt Busiek. I enjoy Astro City, and Secret Identity, and I believe he is a good writer. As much as I do not want to provoke Kurt's ire and lose his interaction with this site, I put my own honesty over good relations, and honestly, this issue was a deal-breaker for me. Kryptonite Man as a concept was one of my last compelling concepts Kurt and team introduced that I was eager to see fleshed out. All that's left now is Camelot Falls, and I'm not super-excited about that after a series of lamentable issues. To put nothing toward the fact that the whole issue, on its surface, seems like one big plug for Countdown, which has been embarrassingly bad, I'd say you can safely pass on this issue. I want my time back. Art - 3: The art tells the story well, but nothing extraordinarily sticks out as wowing. There are a few odd expressions and panels, like the "Beatles fan" girl in the opening splash, and there are a few action beats that fall flat. But the story is conveyed in regular style, nothing was difficult to understand, and it wasn't tragically awful. Cover Art - 3: My comic store guy ribs me when I cry out loud at the words on the covers when I pick them up in the shop. He says, "Come on, Neal, have a sense of humor, it's a throwback!" A bud turned to him this week and said, "Then throw it back!" "You can't defeat words on a cover. But good marketing can!" Aside from the awful words (which, if you cover up with your hand, can be ignored in the face of the compelling image), it depicts a scene that didn't occur in the issue, a peeve of mine (false advertising). Still, it's a good pose if you cover the words, so I'm gonna stick with a three. C'mon, guys, enough with the cheesy phrases on the covers. ENOUGH. Oh, and that "Countdown" thing on the top? That's gonna make your book less likely to sell right now. I'd axe that too.